A couple more reports out this week confirm the rapid decline in the importance of religion in Britain and even growing hostility towards it. Both of these deal to some extent with the aftermath of the scandal of Muslim faith schools and state schools with a predominantly Muslim population in Birmingham being infiltrated by Islamic extremists. They also come on top of the recent success of UKIP in the election for MEPs on an anti-immigration platform. One consequence of all this has been calls, especially in right-wing circles, for schools to be required to teach 'British values'. 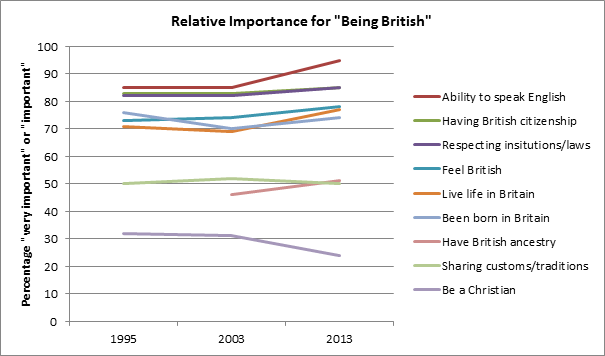 The first report, British Social Attitudes 31, published today, explored people's ideas of what attributes make someone British. To some extent these reflect the current hostility to immigration from the European Union and a general prejudice against people who don't speak much English, as though that itself reflects some sort of rejection of Britishness. Not surprisingly, an ability to speak English was highest on the list with 95% or people thinking this was 'important' or 'very important'. What stands out in this survey however is how 'being Christian' has fallen further in the last ten years, admittedly from an already low start with only 31% giving this any importance. That figure is now down to 24%. The only other attribute to decline was 'Sharing customs/traditions', of which religion would normally be regarded as an integral part. 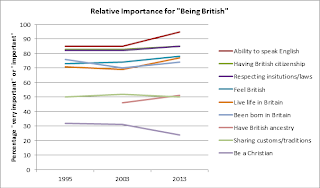 Brits are increasingly rejecting Christianity as part of our national identity. At one time, being 'Church of England' with the monarch as head of the national church, would probably have been high on most people's list of what makes a Brit British, if not at the top of it. It would be interesting to see how much of the hostility to EU and 'New Commonwealth' immigration is because they tend to be more religious that the 'indigenous' Brits. One of the paradoxes concerning Caribbean immigration in the 1950s and 1960s was how closely the immigrants resembled pre-war Britain in their conservative, church-going Christianity, just as Britons were giving it up, making what would previously have been seen as something typically British look oddly out of place in modern, post-war Britain. The second survey, commissioned from Opinium Research and published in the Observer last Saturday, examined attitudes towards faith schools, how they should be funded and what should be taught in them. Again we see a general hostility to faith, or at least to the role it plays in education. 58% of people have some objection with 23% thinking they should be banned altogether and 35% thinking they should not receive any public funding. More than half of UK adults (58%) have some objection to faith schools in an exclusive survey for the Observer, with 23% saying they should be banned completely and 35% saying they should not be funded by the state. Opinium Research carried out an online survey of 1,002 UK adults aged 18+ from 12th to 13th June 2014. Results have been weighted to nationally representative criteria. Welcome though this trend is, it's probably unwise to read too much into this one opinion poll coming in the middle of an on-going, possibly politically motivated, controversy over especially Muslim faith schools and the so-called 'trojan horse' letter and with immigration being raised as a major issue during the EU election campaign. Part of the 'problem' appears to be two senior Tory ministers, Michael Gove and Teresa May, maneuvering for position for a leadership challenge after the next general election, and each keen to make the other look incompetent and not defending 'British values'. The Tories are not called 'The Nasty Party' for being nice people. It will be interesting to see if this apparently growing hostility to faith schools is maintained. If so, it would be better if it came from a rejection of religion per se rather than from hostility to immigrants with its overtones of xenophobia and racism. It is slightly worrying that it seems to be entangled with racism and xenophobia rather than coming from an understanding of exactly what Islam is and what it teaches. That should be reason enough to reject it rather then merely because it's 'foreign' and un-British. The Humanist movement needs to distance itself from the political right and avoid becoming associated with racist bigotry and intolerance. Opposition to Islam as a superstition is no more racist that opposition to Anglicanism is. It is worrying that the faith schools that are drawing attention are the Islamic ones when the Christian ones and other faiths have been doing the same things for hundreds of years. If people are getting upset about that they need to realise that if they take Islam out of schools they will have to take other religions out too. Maybe we are finally ready for that now. I agree that the main thrust of the argument is that religion is nothing more for britishness than an historical tour. As for the far right and dislike of all things foreign we can't do without the input. British white children are not educated well enough for the future demands of a competitive country's needs. So let us not waste any further of our children's minds on stultifying religious practices.